Hello, friends! 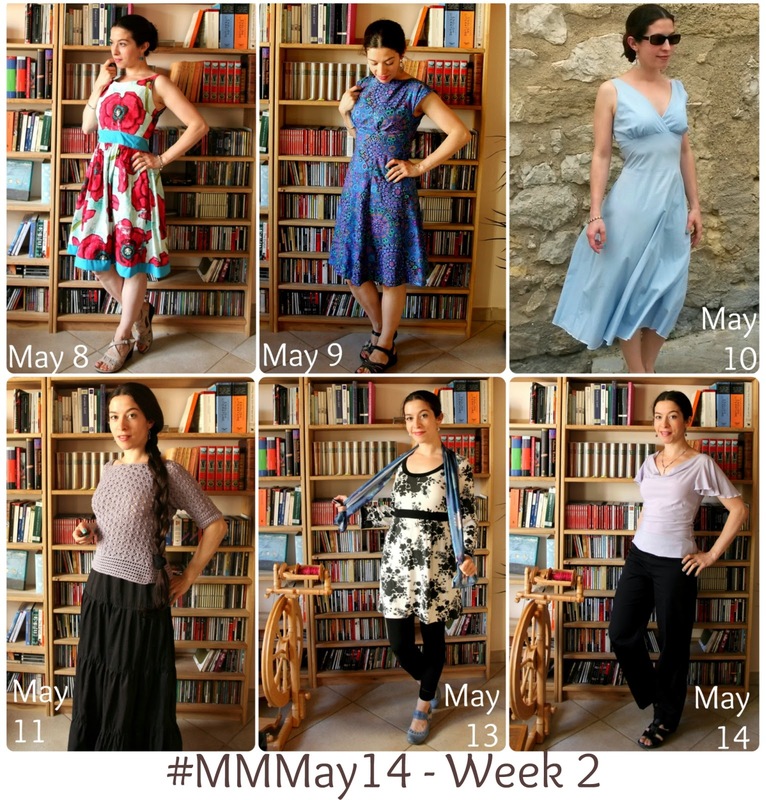 Here is the roundup for my second week of Me Made May 2014. May 8 (holiday): Poppy Fields Dress – seemed appropriate for Armistice Day. Pattern is the Monique Dress by Sew Serendipity Studio. Fabric by Laura Gunn for Michael Miller. Made in 2011. It was very warm and sunny. May 9: Blue Anna Dress, out of a By Hand London pattern and a fabric designed by Kaffe Fassett, and made a few weeks ago. It was 30° C on Friday! Blogged here. May 10: The Olivia Dress – New Look 6557. Possibly my most favourite dress ever, definitely my most worn. I’ve been altering it to fit me over the years. Made in 2006, named after the friend who gave me the fabric. Blogged here. May 11: Crocheted top from the Rowan Summer Crochet book. Design name is Menorca but I named this top the Amsterdam top as we travelled there just as I finished it. Crocheted out of Rowan Siena. Blogged here. Skirt is self-drafted from my tutorial for a tiered skirt. May 12: I worked a very long day on Monday and didn’t have a chance to take a picture (other than a mobile picture on the train). This was my first clothes repeat for Me Made May: Clothkit skirt that you can see in last week’s Me Made May roundup. The temperatures dropped significantly after the weekend. May 13: Another very long day but I did manage to snap a picture. Another repeat – my floral tunic from Onion patterns. May 14: Top: New Look 6470, sewn in 2008. Trousers: another New Look pattern but cannot remember which. Sewn in 2009 or 2010. Necklace is also handmade, and a treasured gift. See you soon for Week 3! I can’t believe we’re already halfway through the challenge – and through the month. hope you are all having a fabulous May. Looking good! I love the crochet top especially! Fabulous! I think the poppy floral is my fave of this week's selections. I have bee threatening to sew up so clothes for myself. I am just not satisfied with what I find in the shops. All “young and hip” by I certainly AM NOT!! I wish there were more classics in the shops. I love all of your outfits, beautiful work! Merci pour ce gentil clin d'oeil.